On Wednesday night, Ole Gunnar Solskjaer will lead Manchester United out into Old Trafford for the biggest game of his nascent managerial career. Yes, the reward for overcoming Paris Saint-Germain is a two-legged date with the mighty Barcelona, the first of which offers United the chance to establish the advantage in the tie before the return leg in the Camp Nou on April 16. Lionel Messi remains the Catalans’ main threat but much has changed since United last faced Barcelona. Here, we break down their recent tactics, strengths and weaknesses ahead of Wednesday’s showdown. Like they were in 2011, Barcelona are chasing the treble. They came up short in the Copa del Rey final under Guardiola that year but have given themselves a great shot of achieving it under Ernesto Valverde. They are ten points clear in La Liga and will face Valencia in the Copa del Rey final on May 25. More pertinently, they have been in excellent form recently. They are unbeaten in all competitions since January and haven’t tasted defeat in the league since November. They are also unbeaten in this season’s Champions League and have already had their way with Premier League opposition, beating Tottenham 4-2 at Wembley. The Blaugrana have looked imperious of late, dispatching Lyon 5-1 to reach this quarter-final before comfortably seeing off Real Betis and Espanyol to take command of the La Liga title race. It is worth noting, however, that while United will enjoy a weekend off before welcoming them to Old Trafford, Barca will have come through Saturday evening’s clash with Atletico Madrid, the side closest to them in Spain. Although Valverde is expected to rest several players for that game, the squad as a whole won’t be as fresh as United’s. 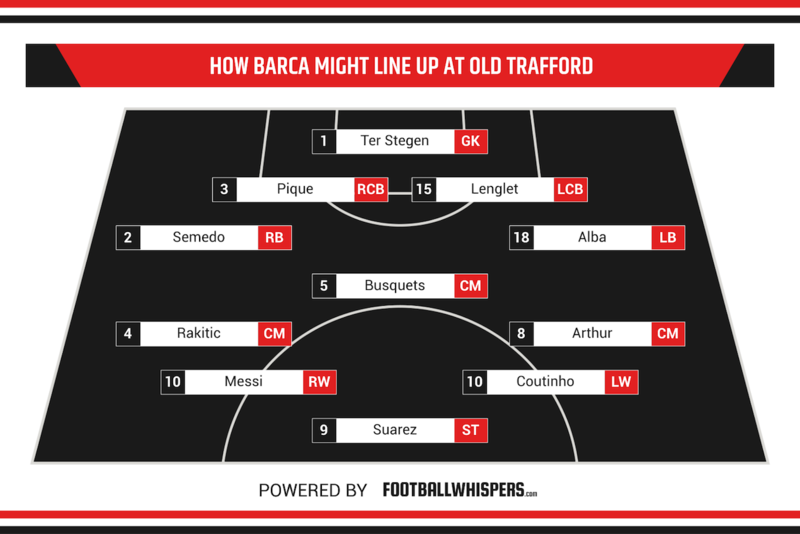 Barca are far removed from the tiki-taka masterpiece that dismantled United in 2011, with key practitioners such as Andres Iniesta and Xavi having moved on. But make no mistake: they remain a fearsome, devastating unit capable of bringing any defence to their knees. Barca, as usual, are at their best when they’re flooding forward. Valverde usually lines up in a 4-3-3, which sees full-backs Nelson Semedo and Jordi Alba push high up the pitch and Sergio Busquets anchor a midfield alongside Ivan Rakitic and, usually, Arthur Melo. Up top, Luis Suarez and Lionel Messi had struck up an understanding with Ousmane Dembele but Philippe Coutinho has played off the left during the Frenchman’s absence through injury. In the Champions League this season, no team has managed more shots on target, shots from outside the box and shots on the counter-attack. Dembele, whose participation in the game at Old Trafford is uncertain, is a key facet of their counter-attacking style but the pace of Coutinho, the ingenuity of Messi and the intelligence of Suarez should ensure their fast breaks will be something with which United must contend. As with PSG, United will have to accept long spells without possession and cannot afford any lapses in concentration, or Messi will pounce like Kylian Mbappe, who darted in between Eric Bailly and Victor Lindelof before sweeping the ball past David de Gea, a goal which left Solskjaer’s men with a mountain to climb in Paris. Indeed, Messi does tend to save his best for English teams, with 22 goals in 29 appearances. Although they conquered that particular task, Barcelona are much more well-versed in getting the job done in the latter stages of this competition. United cannot expect the Catalans to be as accommodating. It all sounds very daunting for United. It should; it is Barcelona, after all. But they are not without their vulnerabilities. Taking the defence out of the equation, Barca are not the strongest in the air. Only one team has won fewer than their 10.37 aerial duels per 90. This season, they have been far from impenetrable at the back; Villarreal put four past them on Tuesday night while Real Betis did the same in November. One of Barca’s biggest weaknesses is a continued dependency on Messi. When the Argentine has an off day – yes, even he struggles at times – it seems to affect the entire team. At this stage last season, Messi was poor against Roma as the Italians ran out 3-0 winners to reach the semi-finals against the odds. But that’s pretty much it. They are incredibly strong across the park; quick, aggressive, intelligent and clinical, there is no point sugar coating the scale of the task facing United across 180 minutes of football. 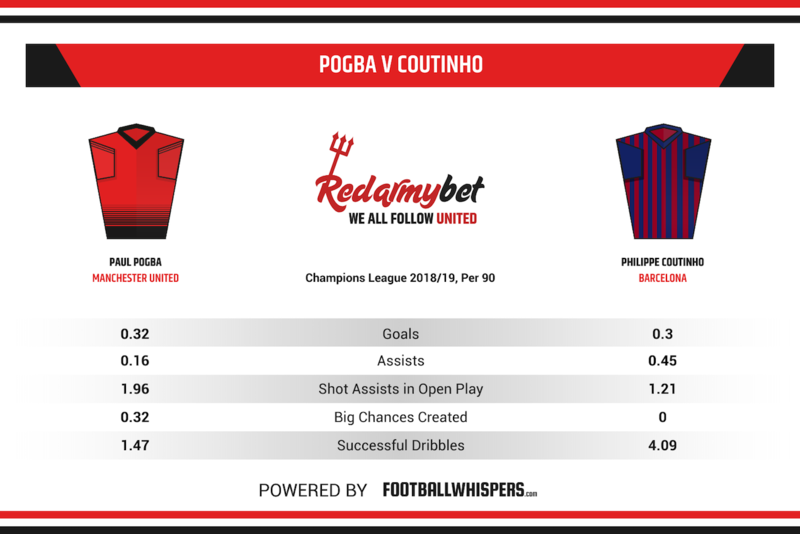 It’s unfair comparing Messi to anyone so we’ve plumped for a more evenly matched pair: Paul Pogba and Philippe Coutinho. United managed to negotiate the return leg against PSG without Pogba, who was suspended following his red card at Old Trafford, but Solskjaer will be delighted to have the Frenchman’s skillset this time out. Coutinho, meanwhile, needs no introduction. United know the Brazilian well from his five years at Liverpool and, while he has not produced his best form at Barca, he remains an extremely dangerous player capable of scoring a spectacular goal from distance or changing the game with a defence-splitting pass. 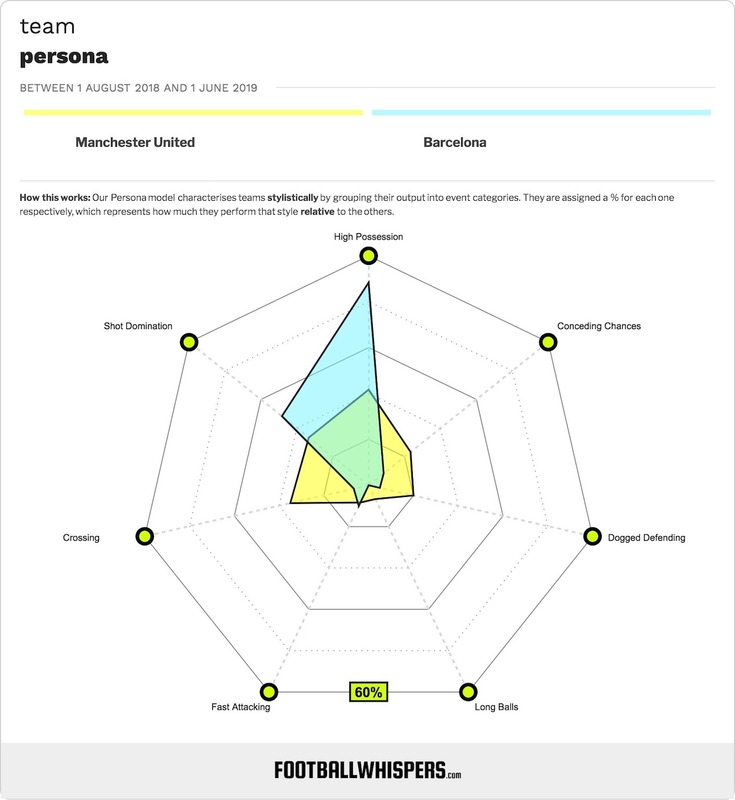 It’s going to be an immense test of United’s mental and physical attributes. Some naysayers feel as though luck was the deciding factor in overcoming PSG but Solskjaer can silence doubters by leading his side to an encouraging result here. The return leg in the Camp Nou will be daunting but if United can prevent Barca from nicking an away goal, anything is possible.